. . . and babies make four. : 12 Days of Christmas. 12 Days of Fun. STARTS TOMORROW! 12 Days of Christmas. 12 Days of Fun. STARTS TOMORROW! Mark you calendar! The 12 Days of Christmas starts TOMORROW, December 9. I'm sorry for starting a couple days late. I'm in charge of a big event this Saturday and two events next week and I'm just a little behind. I am really excited for the 12 Days of Christmas this year! I have 12 wonderful gifts to give away and lots of crazy-talented people who make and sell beautiful things to share with you. Someone recently asked me if I get paid to do this giveaway, or if I get duplicates of some of the prizes to keep. Rest assured that I don't. It's just genuinely fun for me to share the things that I've found with you. The person, or business, who is featured is the one who generously provides the prize and I'm just the lucky messenger. And speaking of prizes, the first prize will be posted on Wednesday, December 7 at 6:00 a.m. CST! 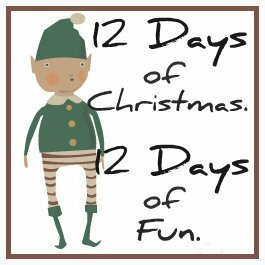 If you'd like an extra entry in the first giveaway, just share the link -- you can grab it on the right -- to the 12 Days of Christmas giveaway or post something on your blog or Facebook page and then leave a comment telling me you shared it on the first day giveaway. You also can get an extra entry on one day of your choosing if you are a follower of this blog or you become one. All you have to do is leave a separate comment to let me know that you're a follower. This is going to be fun. I hope you'll play along! I love when you do this! You totally pick the best items. thank you for hosting again and find some treasures along the way! can't wait to see what's under that "tree"
Can't wait! Thanks for doing this again! !